When I began teaching mind healing (in the nineties) to people – including doctors from the finest hospitals in the United States – things were very different than they are today.
" What causes the power of the mind to make the body well?" Thank goodness we have come a long way since i began this pursuit. It is interesting to me that despite all scientific proof, some people still doubt the effectiveness of mind healing techniques. They know that placebo’s work but they don’t employ the principles to work FOR them in their own lives. Just as positive power thinking can accelerate wellness, doubt and disbelief actually reverse the process. Years ago I interviewed the author of The Biology of Belief, cellular biologist, Dr. Bruce Lipton, on my radio show. He explained how, from from a scientific point of view, your beliefs and perceptions change the physical structure of cells. What you believe and perceive about your world are more important to your health than the genes. Dormant cancer genes, for example, can be activated if someone believes they will get cancer. Here is a MUST WATCH conversation between Wayne Dyer and Bruce Lipton discussing this topic. It starts a little slow but you can fast forward a couple minutes. it will be worth your time, I promise. Just as sick genes can be “activated” by mind, positive mind power can heal. Since the 1970’s doctors have noticed repeatedly how so-called “guided imagery” can facilitate reduction in symptoms, even outright remission in some cases. Back in the 70’s mind body healing was a radical notion from anyone with an MD after their name. When people like Dr. Carl Simonton, author of Getting Well Again, pioneered an entire mind body approach to cancer treatment, the world couldn’t help but notice the results. By combining relaxation techniques with positive visualization, cancer patients, around the world, were given new hope. 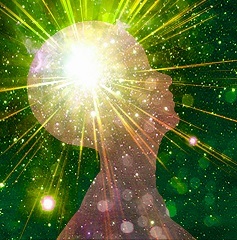 The benefits of meditation for healing or specifically mind visualization exercises combined with relaxation techniques have been SO widely reported that they have become a mainstay of modern allopathic medicine.